Relive the past in the unique setting offered by the Yukon Beringia Interpretive Centre. The ancient land of Beringia, home to giants like the woolly mammoth, giant short-faced bear, the ferocious scimitar cat and the First People, is mysterious and magical. The Yukon Beringia Interpretive Centre is both informative and engaging, highlighting many aspects of a very distinct part of Yukon history. 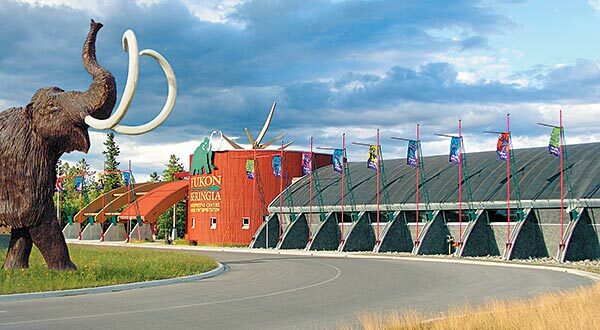 The Yukon Beringia Interpretive Centre is in the perfect location for entertaining out-of-town groups or as a gathering place for local business people. With a full range of audio/visual equipment and a 200-seat theatre, the Beringia Centre provides the perfect venue for meetings and presentations. Private dinners, award presentations and other events become more exciting when seated under the magnificent presence of a woolly mammoth. The Centre’s ice age exhibits are great conversation pieces and provide a unique backdrop when mingling with friends or colleagues. The Beringia Centre has tables and chairs available for the occasion. ? ?For any reception, whether a wedding, cocktail ball or a thematic party, the Beringia Centre offers a unique atmosphere and ample space. Many receptions have successfully been hosted in the facility. The theatre with a wide variety of audio/visual equipment is available for multi-media presentations, lectures and seminars. The comfortable theatre encourages interaction between the audience and presenters. Other parts of the exhibit halls can be used to host smaller events or breakout sessions.